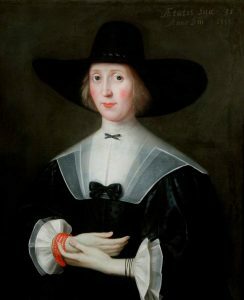 This portrait of a lady was overpainted to make her look more "demure"
This painting is from Berwick Museum and Art Gallery’s Burrell Collection. It is of the English School, dated 1638 but the artist’s and the sitter’s name are now lost. Following conservation work on the picture, it was discovered that the painting had been subtly altered in order to remove a flower in the lady’s hand and add a more modest neckline. It is possible that this had been done to make it more acceptable to the portraits primary viewer, possibly the woman’s suitor or husband, or that it reflects a change of personal of familial religious allegiance, i.e., the family may have adopted a more robust form of Puritanism, for example. This kind of alteration in an artwork is known as a pentimento, from the Italian “pentirsi” which means to repent or change one’s mind. The text in the corner reads “Aetatis sua 31” and indicates that this woman was painted aged thirty-one years old. It is likely, but not certain, that this image was produced when the woman was married. We could further speculate that the original image of the woman (with low neckline and flower) was an earlier picture painted for a suitor. The image was perhaps changed to reflect the new status of the woman as a householder, i.e., a woman with responsibilities for running the family home, educating the children, supervising the servants, the finances and aspects of the estate. We know this woman was relatively wealthy. The portrait itself is a clue, as is the red coral bracelet. This, together with the flushed cheeks of the sitter, give a splash of colour to an otherwise monochromatic painting. The artist was perhaps using coral as a symbol of the virtuousness and modesty of the sitter. Coral was also considered to be ‘apotropaic’, or able to counteract evil, and was often given to children to wear around their neck or even chew on to help teething. The bracelet could possibly be ‘prayer-beads’ – red coral used in such a way may have represented Christ’s blood sacrifice which is why it can often be seen in religious paintings, adorning the infant Christ or his mother. If they are prayer-beads then it could be argued that this woman wanted to communicate her religious views (i.e., not strictly Protestant as prayers-beads are from Catholic tradition) or those of her husband. Similar beads adorn Native American women in portraits from the period so this jewellery may indicate that this woman came from a family of merchants, traders or perhaps even colonists.